We wanted to try dim sum at a new place, and we also wanted to try ordering ourselves (aka not having a Chinese-speaking friend with us). 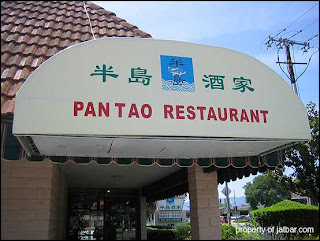 So we found a place in Sunnyvale (it was maybe ten minutes away), called Pan Tao. It was noon on a Sunday, and we waited about ten minutes for a table (this was after scouring for a parking spot in their teeny tiny lot). Water and jasmine tea were served right away, and it was only a couple minutes before the first cart came by. The carts were frequent, and we chose five dishes overall. Since it was a seafood place, they were all seafood dishes, LoL. The Shrimp & Spinach Dumpling was good, but the spinach was a little overwhelming, but much better with some soy sauce (which, by the way, they do not offer a low-sodium option). We had Shrimp ground up on Green Pepper, which was pretty good. 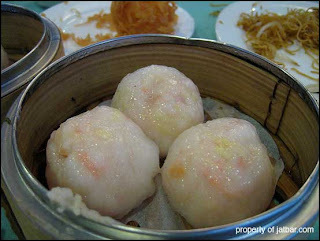 I wouldn't get that one again, mostly because I prefer a noodle/dumpling component to my dim sum. Jonathan didn't care much for that one either, as I ended up eating three out of the four pieces. Their Shrimp in Rice Noodle, on the other hand, was all Jonathan. I didn't care for the sauce on it at all, it was way too sweet for shrimp and noodle. I should note, though, that you got six pieces instead of four, AND it was cheaper than at Fu Lam Mum. We also had this weird item... it was a sticky ball covered in rice with a solid shrimp center. It was delicious and very filling. We should have gotten two helpings of that one, LoL. Finally, there was the Shrimp and Scallop Dumpling (pictured left), which was more of a ball than a dumpling. It was good... and different... but a bit odd. Overall, we were semi-comfortable pointing to dishes and using keywords to ask for things. Five dishes was plenty, and our total was about $22. Not too shabby. Jonathan really loves dim sum as a cuisine, and I've got to admit that I'm coming around. I've always enjoyed it, but since we've been out here it's been growing on me even more. Update: we went again (today) before I had a chance to actually publish this entry. We got 5 dishes, four of which were repeats. We got the sticky-rice-balls again, as they're a favorite. We also got a plate of noodles (like a wheat vermicelli with onions and bean sprouts) that was pretty bland. I special-ordered the shrimp and banana roll... which was interesting. The outside was very flour-y, and it was shrimp and cilantro with a hint of banana puree. We also got a crunchy shrimp ball... it was the same insides as the sticky-rice-ball, but instead of rice, it was covered in crunchy flat noodles. Not all that appetizing. We also had some sort of shrimp-egg mess. It was in a pastry, and served in a very thick sauce. I didn't care for it, and neither did Jonathan. It totalled $25 this time, and there was no wait (although parking was still a problem). I felt a little more rushed and we needed our waters refilled more frequently than they were. Goal for next time: learn how to order in Chinese. seriously.